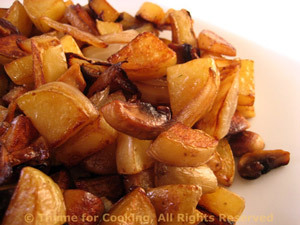 Potatoes Sautéed with Mushrooms, Onions, Thyme for Cooking easy sides. Chopped onion and mushrooms add flavor to simple fried potatoes. Sauté onion and mushrooms in oil in a nonstick skillet over medium heat until starting to brown. Remove onions, mushrooms, garlic from pan and add potatoes - with a drop more oil if needed. Return onions, mushrooms, garlic to pan. Continue to sauté until everything is nicely browned and potatoes are cooked through.